This Applet will help you write Java code. Instead of memorising the 361 conversion functions between the 19 basic types, just use this amanuensis to generate the code, then paste it into your source. 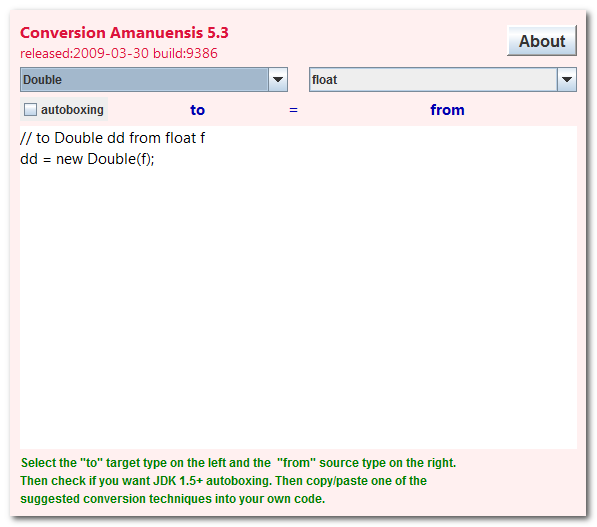 The Converter Amanuensis is also available with Java source to download. source and executable to run this Applet on your own machine as a stand-alone application. for the current version of Conversion Amanuensis. Show you how to write Java conversion code, e.g. String to double. 962K zip for Conversion Amanuensis Java source, compiled class files, jar and documentation to run on your own machine either as an application or an Applet. access converter source in repository with [Tortoise] Subversion client on wush.net/svn/mindprod/com/mindprod/converter/. download ASP PAD XML program description for the current version of Conversion Amanuensis. Conversion Amanuensis is free. Full source included. You may even include the source code, modified or unmodified in free/commercial open source/proprietary programs that you write and distribute. Non-military use only.